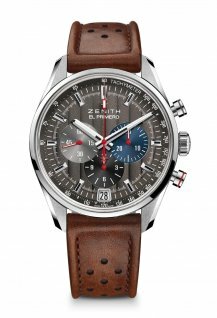 In tribute to the 50th anniversary of the El Primero chronograph, Zenith is unveiling an anniversary boxed set containing three chronographs with tricolour counters. 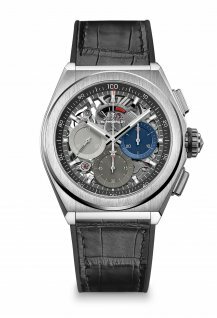 This 50-piece limited-edition trilogy includes a reissue faithful to the first El Primero model of 1969; a Chronomaster El Primero with optimized movement; and a Defy El Primero 21 to 1/100th of a second. A still-empty fourth cushion sits ready to welcome the next achievement of Zenith in the universe of very high frequency: 1/1000th of a second! 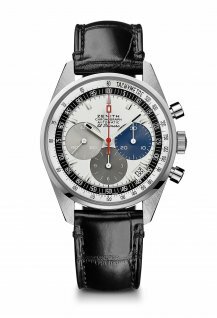 Flashback to the late 1960s, and more precisely January 10th 1969, the birth of the El Primero ‘the first’ in Spanish), the first ever automatic chronograph. Its innovative features – a rate of 36,000 vibrations per hour, integrated column-wheel construction, a central rotor mounted on ball bearings and over 50 hours of operating autonomy (a real feat for such a high frequency) – made it the most accurate chronograph in the world and the only one capable of measuring short times to 1/10th of a second. El Primero also established new visual codes, with a range of contrasting colours that enhanced the readability of the counters: light grey for seconds, blue for minutes and anthracite for hours. This combination would quickly become an emblem of the Maison. 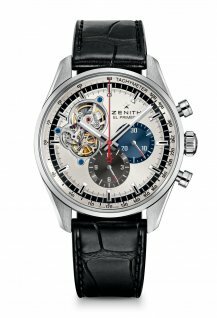 Zenith had never yet offered an El Primero reissue faithful to the original model. This has now been done, since the anniversary boxed set, in a 50-piece limited edition, includes a perfect reiteration of the 1969 El Primero chronograph. The 38 mm steel case, curved glass with magnifying effect, tricolour counters, tachymeter scale, font, the shapes of the hands and hour-markers, as well as the leather strap: all the original codes are resolutely present. Likewise, the shape of the lugs and mushroom pushers are exactly reproduced on this pure "revival" watch. 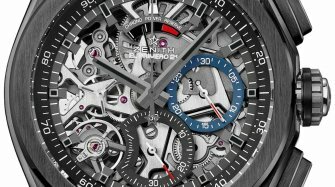 Zenith's engineers and designers laser-scanned an authentic copy of the brand's museum to restore each component of the watch. The only liberties that have been taken are the fact that the initially solid back now reveals the movement without hindrance and that the crown logo has been updated. As for the ‘engine’, it’s the current version of the El Primero column-wheel chronograph movement, beating at a rate of 36,000 vphour and delivering 1/10th of a second precision as well as a 50-hour power reserve. Like the original, it displays the hours, minutes and small seconds, chronograph, tachymeter and date functions, the latter appearing between 4 and 5 o’clock. A direct descendant of El Primero, the Zenith Chronomaster is its most emblematic contemporary embodiment. Therefore, the second watch in the case is a Chronomaster, equipped with a new-generation El Primero engine and a new black ceramic bezel. 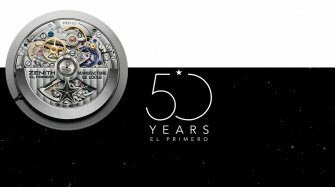 Renamed El Primero 3600, its movement is presented in an optimised version. This high-frequency calibre, beating at 36,000 vibrations per hour, achieves the feat of accurately measuring one tenth of a second and offering direct readings on the dial and bezel. The chronograph hand makes one dial turn in 10 seconds, indicating at each jump the tenth of a second on a scale graduated from 1 to 100. With this 2.0 version, the original construction of the El Primero chronograph, consisting of a column wheel and a lever-operated lateral clutch, is visually highlighted and redesigned to enhance its reliability and precision. The most obvious results are the integration of a stop-seconds device for time-setting and a power reserve increased to 60 hours. The new Chronomaster has a sportier and more modern look than its contemporaries, featuring a 42 mm steel case topped by a graduated black ceramic bezel, a star-shaped oscillating weight and a rubber strap with contrasting stitching. The last element of this trilogy, the Defy El Primero 21 chronograph, is the ultra-modern embodiment of the El Primero. Beating inside its imposing 44 mm titanium case is a revolutionary mechanical movement. Oscillating at a frequency of 360,000 vibrations per hour (50 Hz), ten times higher than its predecessor, it measures and displays one hundredth of a second on a scale from 1 to 100. The lightning-quick hand makes a full turn of the dial in one second. The movement has two independent "gearboxes", one for the time and the other for the chronograph. Its skeleton dial features three solid counters in the original colours – the common denominator of this "tribute" edition – and its contemporary lines, formed by a large fluted crown, flat pushpieces and short lugs, merge seamlessly onto the wrist by means of a black rubber strap covered with black alligator leather. 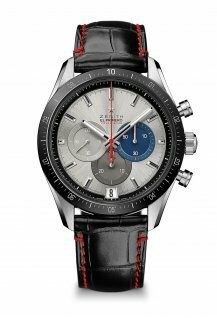 Each issued in a 50-piece limited edition, the three El Primero anniversary watches are presented in a boxed set that also symbolises Zenith's evolution and future in the field of high frequency. Subtle nuances of grey, leather touches, contemporary woodwork: the presentation box combines watchmaking tradition with innovation in performance and precision. The satin-brushed grey lid with built-in touch screen opens to reveal a reproduction of a miniature watchmaker's workbench, complete with a watch mechanism on a rest, adjustable lighting system, magnifying glass and screwdriver. 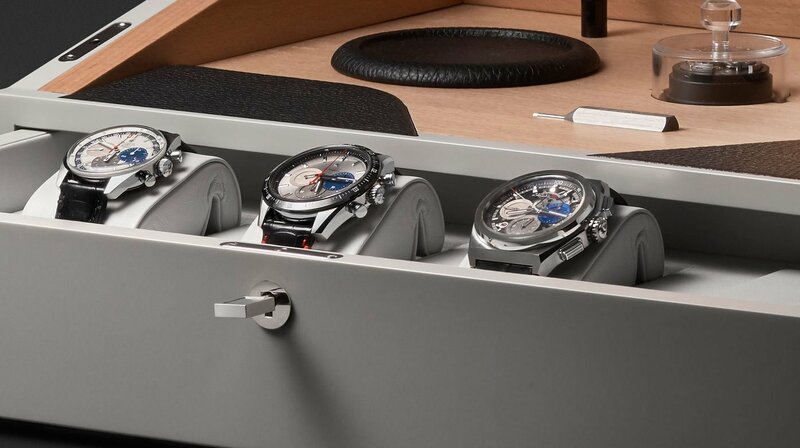 The screw-locked lower part of the box contains a drawer in which the three El Primero chronographs are nestled. In a nod to the past, the box contains an actual die of the chronograph’s coupling-wheel bridge (one of the emblematic components of the El Primero movement). This die is an invitation to purchasers to come and visit the Manufacture in Le Locle and to hand-stamp two coupling-wheel bridges. One will leave with the purchaser in his box, and the other, engraved with his name, will be placed on the entrance wall of the attic chosen by Charles Vermot, the Zenith watchmaker who – in the midst of the quartz crisis in the early 1970s – saved the elements essential to the production of the El Primero calibre from destruction by secretly keeping them in that same attic and thus enabled its renaissance in 1984. Ever since it was founded, Zenith has been cultivating the ability to open up new horizons by assisting with some of the most remarkable human achievements.